But DLF Ltd, India’s largest developer, is expected to report an improvement in margins in the third quarter, largely due to the high-margin sales of their plots in Gurgaon. Analysts forecast that following last year’s bribes-for-loans controversy, public sector bank lending to the sector may slow in 2011. Aside from this, the Reserve Bank of India’s hawkish stance on the industry and monetary policy tightening measures will serve to increase interest costs. The approval for fresh loans and the refinancing of maturing lines to developers may also take longer. Slowing residential sales for most realtors haven’t helped either. Mumbai’s home registrations were down 15% quarter-on-quarter (q-o-q) in the October-November period owing to a steep rise in prices varying from 15% to 25% in various micro-markets. “Execution of projects will be the key factor for growth for most companies in the coming quarters,” said Parikshit Kandpal, analyst, Ambit Capital Pvt. Ltd, a brokerage. India’s top real estate developers will announce their results over the next two weeks. A Mint poll of five brokerages estimates DLF’s net profit at Rs.536.56 crore for the quarter ended 31 December, 14.7% higher than the year earlier. Revenue is set to rise 12.95% to Rs.2,430.68 crore. DLF’s net profit is seen up 16.9% on a 14.2% rise in revenue from the second quarter. According to brokerage India Infoline Ltd (IIFL), against the sales guidance of 12 million sq. 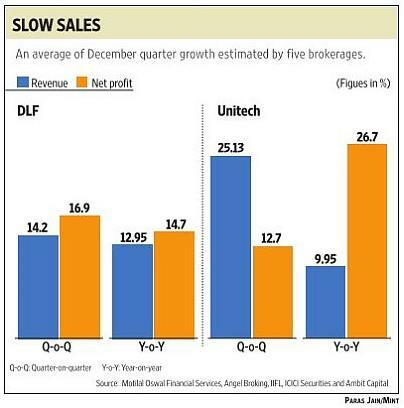 ft in FY11, DLF has sold only 4 million sq. ft in the first half. With only 1.8 million sq. ft launched in the December quarter, doubling of sales volumes in the second half looks difficult. As for Unitech Ltd, India’s second largest developer by market value, analysts estimate an average 9.95% year-on-year (y-o-y) rise in third-quarter revenue to Rs.851.51 crore and a 26.7% increase in net profit to Rs.214.20 crore. Over the second quarter, profit and sales may have risen by 12.7% and 25.3%, respectively. According to IIFL, Unitech expects to clock 10 million sq. ft of sales in FY11 against 16.6 million sq. ft in FY10—a 40% drop in volume. The developer has taken a 5-10% rise in its prices and expects the higher realization to compensate for the fall in volume. Housing Development and Infrastructure Ltd (HDIL), a Mumbai-based developer with a focus on slum redevelopment, is expected to show strong sales during the quarter, according to estimates. Analysts attribute this to HDIL’s strategy of pricing its properties 10-15% lower than competition, which has allowed it to achieve robust residential sales. On the strength of customer advances from these targets bringing down projects, HDIL its debt levels considerably. However, for many developers, high debt levels and repayment will be an issue. For instance, Delhi-based Parsvnath Developers Ltd currently has a debt of Rs.1,100 crore. At DLF, while earnings will be higher on a q-o-q basis, debt will not come down, Kandpal said. With absolute debt levels for DLF, Unitech, HDIL and Mumbai-based Godrej Properties Ltd remaining high, analysts expect a liquidity crunch and higher interest costs to adversely affect the execution of ongoing projects. Developers in the property markets in southern India, particularly Bangalore, will, however, continue to see good sales momentum on a q-o-q basis due to robust demand, no substantial escalation in property prices and on the back of continued hiring and salary hikes in the information technology sector. Both Sobha Developers Ltd and Brigade Enterprises Ltd, two Bangalore-based realty companies, are expected to report higher sales for the quarter, said Edelweiss Securities Ltd. The Bombay Stock Exchange’s realty index has risen about 36.09% over the past year, outpacing the benchmark Sensex’s 9.55% rise.